and grow your revenue and profit. Bring on new virtual clients that our powerful search engine marketing sends to you. Offer Digital Mailbox service to your current clients as a new revenue source. List your address on our highly-ranked iPostal1.com website. Effective web-based marketing attracts visitors searching for a professional office building address like yours. Virtual clients get Digital Mailbox service with an option to add phone and fax. Your clients use our free app or go online to view their postal mail and packages, then request scans, forwarding, or other services – anytime, from anywhere, on any device, with just a click. Our cloud-based technology makes it all so simple, easy, and efficient! We train your staff to manage the mail with our Digital Mailbox technology. Workspaces participating in our iPostal1.com program choose the address type pricing tier that best fits their business strategy and display photos of their building exterior and office space on our website. Workspaces participating in the iWorkSpaceMail program for their existing clients may offer this as an opt-in service or bundle it with a service package. 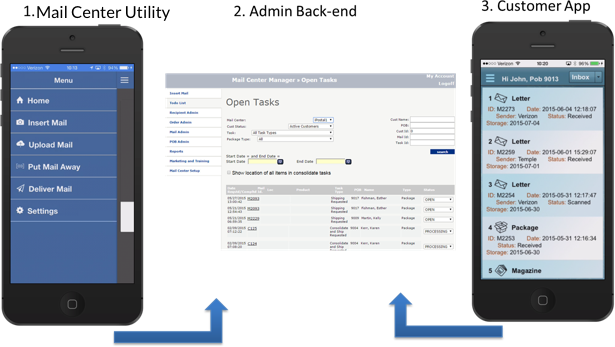 With either program, clients use our app or go online to manage their mail and communicate seamlessly with your staff. Visitors to iPostal1.com choose a Digital Mailbox plan and a location. When they choose your address, you get a new virtual client, often from another city, state or country – clients who otherwise never would have found you. Earn revenue from monthly mailbox fees and optional services requested. Our proprietary software screens credit cards, automates payment, and makes signup with Form 1583 easy. Offer all the benefits of Digital Mailbox service to your current virtual and in-house clients as an optional service or bundled as part of a service package. We charge you a fixed price per active Digital Mailbox user. You set the pricing and invoice your clients directly to earn the margin you want for the monthly fixed fee and any additional services requested such as scanning or mail forwarding. New clients are the lifeblood of your business and you never have enough. Virtual clients are very profitable and there is no limit to how many you can add. Take advantage of the powerful marketing engine we have built that will send new virtual clients who sign up with your workspace on iPostal1.com. You will generate revenue from new virtual clients and/or from Digital Mailbox fees and services from your existing client base. Earn additional revenues from new virtual clients who utilize your other services such as conference room or day-office rental, lobby listing or notary service. Managing their mail on an app or online will delight your clients and position your brand as customer-focused, innovative and forward- thinking. The Digital Mailbox is branded with your logo, so clients will connect with your workspace whenever they receive or check their mail. Your virtual clients visit your workspace on occasion or perhaps not at all. Tenant clients are often away from the office for days or even weeks at a time. Now they can stay connected and manage their postal mail and packages online no matter where they are, without having to call, send emails, or wait for their mail to be forwarded. No more calls from clients asking ‘what’s in my box’ or emails with forwarding instructions that waste staff time and lead to miscommunication. When clients create a task, it seamlessly appears on the back-end administrative To-Do list, ready to execute. For the first time you and your clients will have a complete record of all mail and packages received and delivered, tasks requested and performed, along with full management reporting. with an app for any smartphone or tablet, or go online! Clients automatically receive a push notification to their phone or email when they receive new mail and then log into their Digital Mailbox from the app or go online. They see a sharp image of the outside of mail or packages so they know exactly what they have in their mailbox and who sent each item, no matter where they are. With just a tap, clients can request that your staff forward or consolidate mail and packages, scan mail content to read or store in the cloud, shred or recycle unwanted items, or deposit a check. For those clients who prefer to manage their mail from their laptop, all the functionality of the app is also available via the online interface. Using our Digital Mailbox technology is easy and efficient. 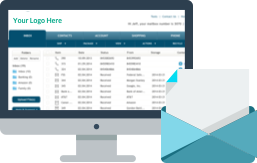 A turnkey, cloud-based Digital Mailbox technology platform that any size office center can easily adopt, with no expensive equipment or complicated IT installation required. Seamlessly integrated with the admin operations interface, so performing tasks is efficient and simple enough for any employee to do. Easy and quick entry of letters and packages into the client’s Digital Mailbox from a smart phone or desktop scanner. New mail notification sent automatically. Backed by strong training and support. To list your workspace on iPostal1 or learn more, please provide your contact information or call 845.579.5762.
iPostal1 and iWorkSpaceMail are divisions of USZoom, LLC. USZoom is the worldwide leader in providing Digital Mailbox software as a service (SaaS) solutions to mail centers in multiple industries. USZoom offers the largest network of Digital Mailbox providers worldwide via its iPostal1 brand, with 600 locations comprised of retail pack & ship stores and workspace operators. USZoom also provides Digital Mailbox solutions to corporations, apartment and residential complexes, as well as to assisted living facilities. USZoom, LLC is located in Montebello, NY.